Butternut squash is one of my favorite vegetables in season right now! 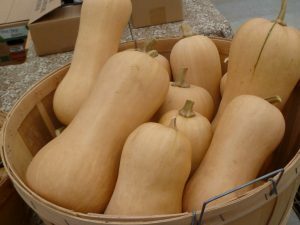 Butternut squash is technically a fruit because it contains seeds. They come in all shapes and sizes with a pale hard skin and bright orange flesh. At the Winter Farmer’s Market last week, I bought the cutest little butternut squash that was the perfect size for cooking for one person. This gourd is the perfect addition to a fall meal and can go a long way! Butternut squash is low in fat, high in dietary fiber and a great source of potassium and foliate. The bright orange color signals that it is full of nutrients such as carotenoids, which protects against heart disease. With only a one-cup serving, you will be taking in about half your daily dose of Vitamin C.
Most winter squash is available late into the fall. Storing the squash in a cool, dry place could keep the squash good for a couple months. I like to cut up my squash so they are easy to cook, chopped squash can keep fresh for a week in an airtight container in the refrigerator. Butternut squash provides a cook with endless culinary opportunities. You could remove the skin and cut into chunks for roasting, steaming or sautéing. Add the butternut squash chunks to your favorite salad or mash it. Once mashed, you can add it to your favorite rice or pasta dish! Bring a large pot of water to a boil. Cook the diced squash for about 12-15 minutes. Using a large slotted spoon, remove the squash from water and put pasta in the boiling water until cooked. Place the cooked squash in a large food processor or blender. Puree until smooth. Add water or broth until it reaches a creamy consistency. Sautee onion and garlic in the olive oil for about 5 minutes. Add the pureed squash and pasta and combine everything together. Top with Parmesan cheese.